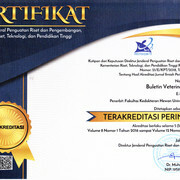 Buletin Veteriner Udayana is peer review journal, published by the Faculty of Veterinary Medicine Udayana University as a medium of information and the development of veterinary science. Published twice throughout the year every February and August. This journal discusses the scientific works containing the results of research in the field of veterinary sciences. The scope of journal is wide and multidisciplinary that publishes original research papers, review articles, as well as conceptual, technical and methodological papers on all aspects includes research findings, experimental design, analysis and recent application in veterinary sciences.